This week I have decided to add a little to my daily practice, and then I may stick with it for awhile. Eorthan Modor, I am your child. Uphold me today and always, as I honor you and walk the elder ways. Eostre, She who walks the paths of Dawn. Guide me today and always, and may your light shine upon my path as I walk the elder ways. This week in the grove meeting we are doing a full moon ritual, which should be fun and also good practice. Everyone who wants a speaking part will be drawing randomly from a hat, and we’re going to try to get everyone used to improvising our ritual pieces. Last weekend, I got to practice my clergy discipline routine of having a monthly “retreat day”. It was spread out over two days, because it’s hard for me to take 24 hours entirely out of my (admittedly probably overscheduled) life, at least every single month. This is the basic text of the monthly retreat ritual that I am working on. As I change and update it, I will update here. I’m actually pretty happy with this ritual though – it’s a full core order, takes about 20 minutes to do. I typically go for more explicitly poetic ritual pieces, but for some reason this one is what I came up with. It’s a variation on another ritual that I used to use, and I’m really happy with how it turned out for solo practice. My Druid altar sits in my “craft” room (it is a craft room both in the sense of sewing and knitting and in the sense of magical craft). The room is just off the main hallway of my home, and I walk by it several times each day going to and from our office. It is, by necessity, in a room that’s easy to close off when we have guests – both because it is not anywhere near appropriate for a small child, and because I am still a closeted Druid, and do not wish to share my religion with my (very Christian) family. The altar itself sits on a bookshelf on the eastern wall, and I use the bookshelf to store all of my magical and religious tools as well as other less obviously religious books (like my mythology books). I try to have it keep a low profile, though my more recent updates have it looking more obviously altar-like and less like just a cluttered bookshelf. I perform all of my ADF rituals here, as well as most of my meditation (I keep a cushion on the floor in front of the bookshelf for seated meditation). The shelf is standing-height accessible, so I stand for all of my ritual observances. On the altar I have a (handmade) metal Tree that hangs on the wall, a trio of votive candles as my Fire (along with an incense burner) and a Well handmade by a carpenter of carefully jointed wooden pieces. I also have two small Tree of Life wood-burned tree pieces from The Magical Druid, to help balance the altar and because I like having the extra representations of trees there. There are as well a set of tingshas I use as my musical signal to begin my rituals, a goblet for offerings and receiving blessings, some small bowls and a tiny pitcher for offerings, and a large wooden bowl to accept offerings, since it seems unwise to pour them on the carpet. I keep my runes on the altar as well, plus a large “holey” stone that a good friend of mine brought back from a military trip. I am sure he thought I was weird to ask him to bring me a rock with a natural hole in it, but he’s a geologist, so I figured he’d be sympathetic. On the second shelf I have two larger candles, mostly because I like candles, as well as some owl figurines (a Nature Spirit I am particularly close to), some amber jewelry (to help me connect with Freya), a wooden acorn (to represent ADF Druidry) and a small green man figure. Future altar updates include adding statuary for the various Gods I work with, particularly Freyr (I am thinking of looking for a small boar to represent him, as that will provoke fewer questions than an obviously phallic statue would) and something for Njord. A small wagon would be appropriate for Nerthus as well. These additions are waiting mostly on budget and on finding statues I like – I tend to find a lot of the things online too shiney or modern or just don’t like them much. I figure I can afford to be picky when it comes to my Gods. I don’t know where exactly I will PUT all of these things, but perhaps it will be time for my owls to move elsewhere, or for me to expand to a bigger surface. 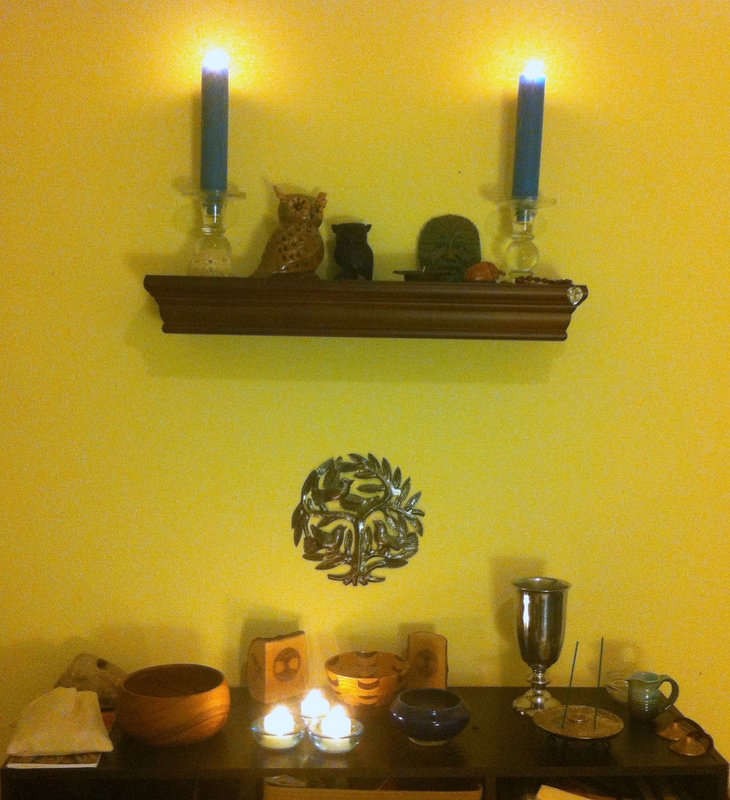 Right now, though, this version of my altar is highly functional, and I am always happy to settle into my rituals here. The setup is easy to use, and not too cluttered, but still contains everything I need. I should note that I also keep a “hearth shrine” at my stove, where I light candles daily as part of my remembrance of my ancestors. There are no ritual objects there, only the candles I burn and my dedication to keeping the stove clean and the area tidy. I try not to light candles there if the kitchen is not clean, out of honor for my Disir. 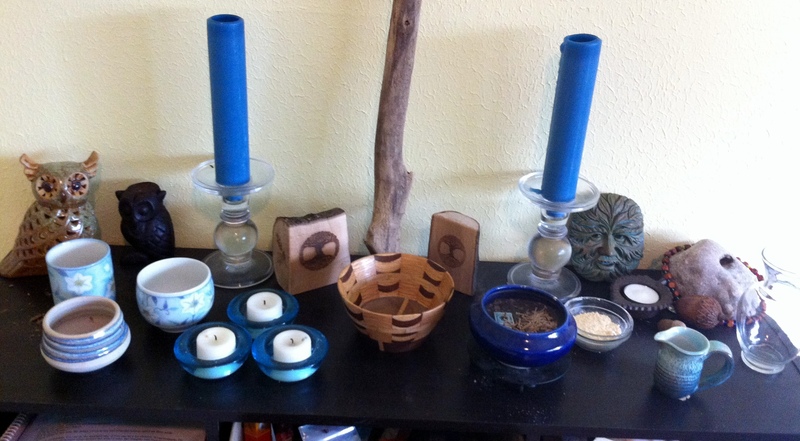 Just a quick update to my altar – I’ve added a new offering pitcher (the little blue one) and a new offering bowl (the ceramic one with blue glaze). These both came out of my husband’s grandmother’s house, as we were helping to clean up her things. 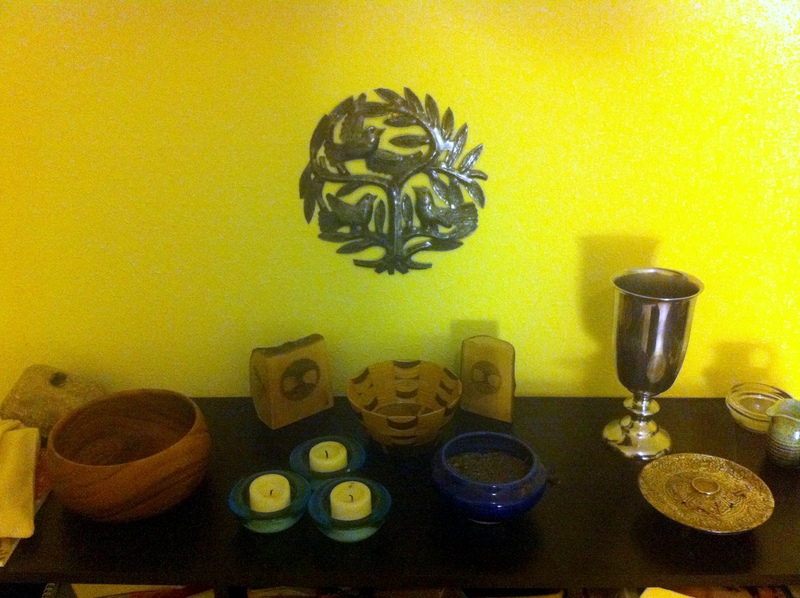 She passed away a few years ago, so I’m happy to have some things that represent ancestors on my altar now. I haven’t figured out quite what I’ll be using them for yet. I think the offering bowl will be one for dry offerings only, since it’s not glazed inside. The little pitcher would be great for oils though, and now that I have some charcoal discs, I may be able to give oil offerings to the fire for the high day! I do move things around when I’m actually using the altar though, and I think it’s more than time I got a little shelf to keep some of this off my working surface. I don’t even have any statues yet, but things feel pretty cluttered. It’s a little hard to move around, and I’m always afraid I’m going to end up with my arm in the fire (again). My Tree is incredibly tall though (almost 3 feet) so I may need to shrink it a bit in order to put a shelf above the altar. Either that, or get myself two small shelves to put on either side of the Tree. I’ve been working on the Ancestors essay for the DP, and finding that it’s a little hard for me to work with. I really like the division of Ancestors into different types of kin – from those whom you are actually related to by blood to those you have a spiritual connection to the ancient ones who worshiped in your chosen hearth culture. Even though I’ve had favorable interactions with them in the past, I’m still not sure exactly how I want to bring the Ancestors into my spiritual practice. Part of this hesitation is that my blood-kin are extremely devout Protestant Christians (like the rest of my family), who would have looked very unfavorably on Druidry in life. I know I should expect that they have a different viewpoint on spiritual things from wherever they are in the afterlife, but I really don’t want to make anyone angry or upset. At the same time, my great grandmother raised 11 kids on a farm in the Great Depression, and lived to read Peter Rabbit books with me when I was small. She was, by all accounts, a force of nature, and I’d love to have her advice on homemaking and life in general. I think my first step will be seeing if I can track down some pictures to have with the other family pictures in my house. I don’t have a lot of experience working with the Mighty Dead, but I could sure use some extra wisdom some days. My family doesn’t spend a lot of time talking about those who have passed away, at least not at this point in time, but I think a lot of that is because my extended family is still relatively intact. My paternal grandparents are still alive, and that’s the part of my family that has the most connection (my mom’s family consisted entirely of my maternal grandmother, who passed away some years ago, so I have no cousins or aunts and uncles to talk with about her). Both sides of my family have done some research into our family history and lineage, but it’s treated very intellectually as opposed to as a way to find family ancestors. I find myself more drawn to the photographs anyway, since I feel like I can actually get a sense of them as actual people as opposed to just names in a book. As for the other types of ancestors, I have a few people who were mentors and teachers of mine who have since passed on. I truly value the time I spent learning from them, and am very glad I had their friendship. I don’t really have anything I can connect to them easily, though, aside from stories and experiences that I had while I was learning from them. Unfortunately I have no pictures of any of them, either. I’d like to represent them somehow on my altar, but a) it’s cluttered enough already and b) I’m not sure what I would use, since they represent a pretty diverse body of people. Connecting to the Ancients who also practiced Druidry is something I haven’t explored at all yet, other than naming them in my Samhain ritual as part of the ancestors who were welcomed and honored at that feast. This might be an area where some focused meditation could work out well, or just working to remember them in my rituals. This particular Kindred seems to include such a wide variety of people and entities. I think that may be why I’m struggling to get my mind around how to honor all of them. I can, of course, lump them together (as will usually happen in a High Day ritual, when one offering will be poured out for the Ancestors specifically), but I think I’d like to make a space for some of them separately as well. If nothing else, I can, when pouring out offerings to the Ancestors, pour out a little to each kind of Ancestor and remember them by type, if not by name. I’d also like to explore how the Norse remembered THEIR Ancestors, since I know they were venerated in that culture. Hopefully with a little more study I can find a balance of things that resonates with me.